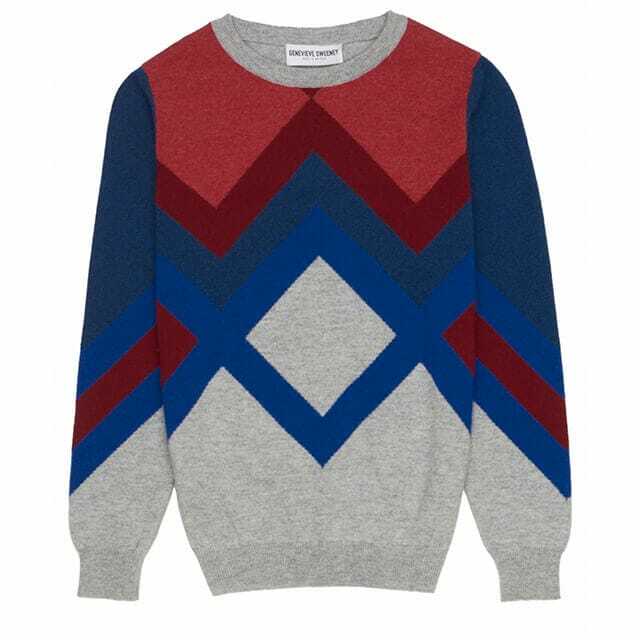 Versatile smart-to-casual bright geometric cashmere jumper, knitted using heritage hand intarsia method. Geometric pattern in striking block colours in 100% cashmere. Knitted using a traditional heritage technique, hand intarsia. The perfect jumper for casual or smart wear, a statement investment piece. Hand Intarsia is a traditional knitting technique; the term meaning ‘inlaid by hand’. The yarn is laid onto the needle bed of the machine, colour by colour to create a clean, refined pattern without carrying floats on the back of the design. This technique has a rich heritage found in the Scottish Borders, an incredibly time-consuming process in which the detail and precision can only be achieved by hand. Inspired by this traditional artisan skill, Genevieve has designed a collection that explores, provokes and reinvigorates this technique by fusing it with contemporary style. This product is made to order with a typical 3-week lead time. 'Genevieve Sweeney is a premium British knitwear designer, who has combined her passion for knitting with refined design, bringing a unique collaboration of sartorial silhouettes and luxurious yarns to the knitwear market. The brand fuses contemporary design with traditional techniques, which results in stylish, high-quality knitwear for men and women. Aside from the luxury fibres sourced from Italy, Genevieve is determined to ensure that her brand is authentically British, showcasing the artisan skills and quality of the knitwear industry in the UK. By establishing herself as an advocate for small local mills and keeping her production within the British Isles, Genevieve is commited to sustainability as well as embracing the ethical practices and responsibilities of a premium British brand. Genevieve has devotedly brought back to life rare antique knitting machines that haven’t been used in over fifty years. These machines have provided the opportunity to explore stitch and yarn combinations, which have influenced the brand’s refined designs and allowed Genevieve to combine them with traditional hand crafted techniques. Genevieve’s credentials include designing and developing knitwear for global brands such as Rag & Bone, Hugo Boss, Burberry and Lyle & Scott. Having worked in New York, Switzerland and London, Genevieve has gained valuable experience and has an in-depth understanding of the current knitwear market.